Earlier this week we released The Secret Life of Greyhound Puppies, a groundbreaking new video that documents the greyhound breeding industry. In a matter of hours, more than two thousand people watched this video and saw for themselves how greyhound puppies live. Across the country thousands of young greyhounds are kept outside in dirt pens and are tattooed at a young age. Meanwhile, breeding dogs endure lives of confinement in small cages. This is a sad reality of the greyhound racing industry, and something we are working to change. Yesterday, The Secret Life of Greyhound Puppies was temporarily removed from YouTube after greyhound breeder Wendy Brotherton filed a false copyright complaint. We immediately responded to this false claim, and expect the video to be fully restored soon. This is not the first time that dog race promoters have tried to intimidate us and prevent the public from seeing what happens to greyhounds. In fact, we have faced similar false complaints repeatedly over the years. Every single time, we have fought these false complaints and won. Most notably, we won a lawsuit by dog track owner Charlie Sarkis in which he wrongly claimed he had been defamed. In addition to winning the case, the court ordered Sarkis to pay our full attorneys fees as a penalty for his misrepresentation. America was founded, in part, on the public right to freedom of speech. When it comes to copyrights, citizens have a fair use for certain uses such as education and public participation. At GREY2K USA, we document the greyhound racing industry in unprecedented ways, and give the public accurate information that allows them to cast informed votes and make good consumer choices. We are proud of our record, and know that our best days are ahead of us. Finally, it shouldn't surprise anyone that greyhound breeders would resort to extreme measures to hide their cruelty. They have a long track record of trying to intimidate lawmakers, greyhound advocates, and the greyhound adoption community. One thing is certain, though. With your support, we won't let them get away with it. I saw the video before it was taken down and just want to thank you for exposing some of the truth. 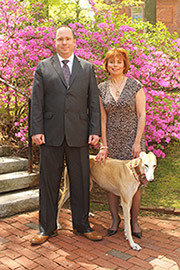 I have a new greyhound who was born in Texas his racing name was Highend Vintage also know as Five Star Show. his sire is Lonesome Cry and the dam was Vintage Song.To see the conditions he might have been subjected to as a pup is a big help in understanding what he has been through and how to help him in future. Thank you all and have a very merry Christmas and a successful New Year for the greyhounds. Sincerly Lisbeth Mønsted Larsen Greyhound Action Denmark. I have rescued a Greyhound from Ireland..that video showed the inhumane conditions these gentle animals endure. Imagine worse conditions in Ireland and the Galgo in Spain, plus and my heart breaks to know, they are in China and Africa now. We as a worldwide community need to expose and educate the lawmakers ... keep up the good work and you will always have my support. I have 2 greyhounds that I adopted in California, I now live in Houston. Thank you for your help in getting the truth out about some of the breeders. These dogs are "greyt" pets and do not deserve to be exploited. We need to investigate more closely to this Greyhound breeders, spy=cam. Shame, shame on these breeders! It's all about the money for these jerks. Having owned greys for over 10 years and loved them- they are such gentle creatures that deserve better! I just watched it, and all I saw were stills of breeding moms with their puppies, their outdoor kennels and runs, etc., all set to sad music. I live in Ohio - trust me, the dogs in puppy mills would trade with these greyhound moms any day. I don't believe in breeding dogs period while so many die in shelters every day, and I am no proponent of dog racing, but I didn't see anything on this video that would constitute cruelty. Tattooing? Definitely not a walk in the park, but I wouldn't consider it abuse. Terri, part of our work involves giving the public accurate information about the commercial greyhound racing industry, and letting them draw their own conclusions. 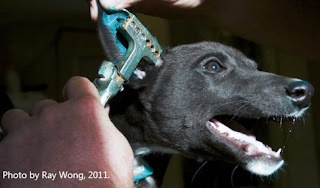 We believe that the standard practices used in the dog racing industry, like tattooing puppies at a young age, keeping young greyhounds in outdoor dirt pens, and keeping breeding greyhounds confined in small cages, goes against our mainstream values on the humane treatment of animals. Isn't there something more we can do to stop this awful treatment of this beautiful breed. It sickens me the way these greyhounds are treated. I did not get to see the video maybe it is a good thing for me that I didn't because just hearing about the deplorable ways they were treated was enough for me.